Year after year, the residents of Colchester have relied on the former Williams and Griffin Christmas window to deliver the Christmas spirit to everyone who passes by. The window has been a festive tradition for the people of Colchester for years. Recently, the store had a huge rebranding as well as a multi-million pound makeover. Unfortunately, this year’s offering from the former Williams and Griffin (now Fenwick) left almost every onlookers underwhelmed after the window was revealed yesterday. The display follows an Into The Woods theme. The Mannequins were surround by autumn leaves and little models of woodland creatures. For onlookers, this felt quite simple and plain compared to the previous years’ display. In the past years, the window has shocked shoppers with big animatronic models, a fully-fledged North Pole post office with hundreds of toys for children to look over and admire. Elizabeth Pinhey wrote: “Massively disappointing Christmas window, really was a big let down, you would think as their first Christmas in Colchester they would have put some effort into it. Els Despriet, marketing manager of the Colchester store, said the comments would be taken on board. 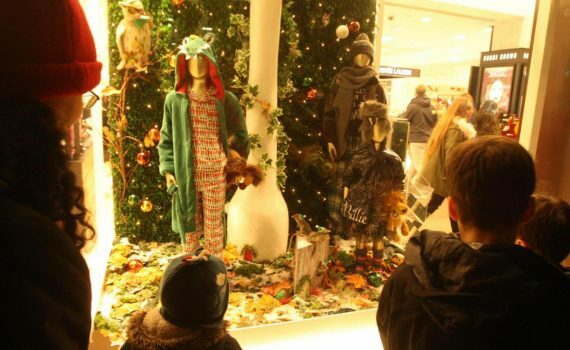 She said: “We have had mixed reactions to our Christmas window this year. “Our Christmas scheme is based around a journey of exploration through the woods at Christmas time – this is reflected not just in the windows, but throughout the store and echoes our journey of redevelopment over the two and a half years. “We appreciate that some customers feel it lacks the traditional Christmas atmosphere and we would like to wholeheartedly apologise for this. What are your thoughts on the Christmas display?